Raptors—the charismatic group of birds that includes hawks, eagles, and falcons—evoke power, swiftness, and grace. Raptors, or birds of prey, gaze calmly about while at rest, exuding confidence and nobility, and, while soaring aloft, they are absolute icons of the California landscape. Featuring descriptions of every diurnal California raptor, this state-of-the-art, beautifully illustrated guide is the first to combine identification of these important birds with a comprehensive discussion of their natural history. Raptors of California notes well-established field marks in addition to introducing several new pointers that help distinguish especially difficult species. More than a field guide, the book also includes information on raptor anatomy, foraging, reproduction, movement, where and how to observe raptors, human-raptor interactions, raptor conservation, endangered species, caring for injured hawks, falconry, and more. Of special interest is the inclusion of previously unpublished descriptions of raptor behavior and many fascinating anecdotes and vivid observations from the field that provide new insights into the lives of these captivating birds. Hans J. Peeters and Pam Peeters have spent all their lives in the field bird watching. Hans J. Peeters, Professor of Biology/Zoology emeritus at Chabot College, is coauthor, with E.W. 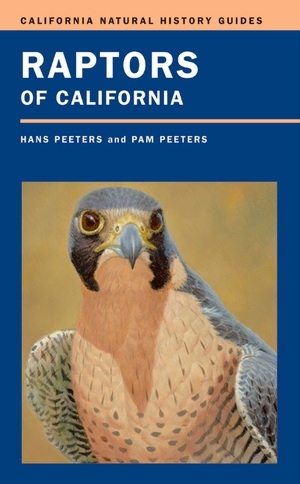 Jameson, Jr., of Mammals of California (revised edition, 2004) and American Hawking (1970). His illustrations have appeared in many bird guides including The American Bird Conservancy’s All the Birds of North America (1997), Book of North American Birds (1990), and the Smithsonian’s forthcoming Birds of India. An award-winning painter, two of his depictions of Golden Eagles have appeared on Mexican stamps.